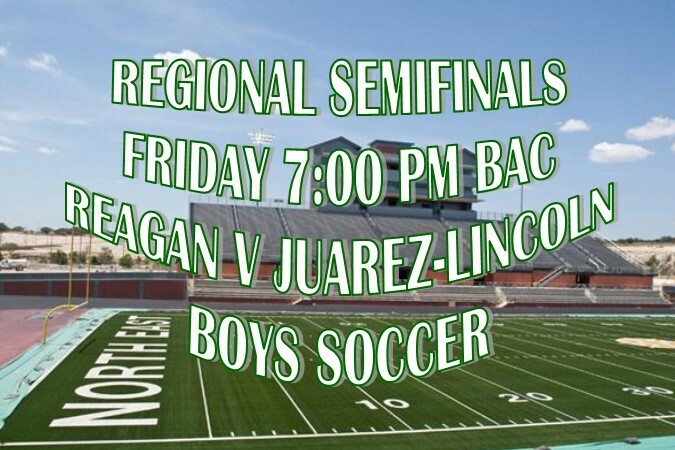 April 12, 2018 – Let’s pack the stands for Reagan Boys Soccer tomorrow night as they face Juarez-Lincoln, from La Joya, Texas, in the Regional Semifinals of the UIL State Tournament. Click here for complete Playoff brackets. Juarez-Lincoln was last year’s Regional Champion and currently has an overall record of 30-5-1. The Rattlers are coming in strong with an overall record of 16 – 1 – 7 and conference record of 8 – 0 – 4. The winner of Friday nights match will face the winner of Lee vs Rivera from Brownsville, Texas, at 3:00 p.m. on Saturday, April 14th. Be prepared to come out for the Regional Finals!